Greater Philadelphia Bicycle News: Can SmartPhone GPS Apps be a Data Engine for Bike Travel? Can SmartPhone GPS Apps be a Data Engine for Bike Travel? With so many GPS enabled phones now on the market, the idea of crowdsourced bike travel data has only been scratched at the surface. In 2007 Portland State University Professor did a bicycle travel study of 176 bicyclists with GPS recorders and found that generally people will travel out of their way to use streets with bike infrastructure. Solid evidence that bike lanes and bicycle boulevards are worthy transportation investments. More recently Bike Sharing services such as Velov in Lyon France have begun quantifying their bike trip data. Currently there are several route and trail oriented websites such as MapMyRide.com, Bicycling Magazine and Everytrail.com. Most of the applications are geared towards fitness tracking but the data could be uploaded online and used to collect data for smartphone applications that can record gps data from your bike, walk or running trip. As usual most of the apps are for the IPhone with some for Android and Blackberry, I do not know of any app for Windows based phones, which would truly open the field to many more cell phone users. 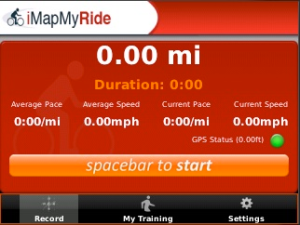 The problem is that there is no convenient central collection point online right now to upload and process the data, for example seeing or downloading more than one route at a time at MapMyRide is a clunky process. AFAIK - "There's no APP for that". Click here for a review of gps smartphone route applications. While smartphone tracking data is indeed helpful, it is naturally skewed by one major factor. It only tracks smartphone owners who are willing to participate! No duh you might say but just think of the types of cyclists who wouldn't participate. #1 - The poor transportation cyclist. Do you really think the guy/gal who is riding his Huffy 10 miles, rain snow or shine, to a minimum wage job has a smartphone?!?! #2 - The person who thinks smartphones are ridiculous (I can live without the internet literally attached to my hip). I'm quite sure this includes many older cyclists too. #3 - Roadies who travel with a minimal amount of tools/gear. #4 - The person who thinks, "Nobody is gonna' track my every movement" (Please tell me I wasn't the only one who has to read "1984" in school). Again, this data is indeed useful since there has never been a way to track where cyclists ride before but the only cyclists I see being captured in the data are young, rich and educated.